After months of anticipation, my sister and I saw Lincoln this past weekend, taking advantage of the movie’s early release in New York City theaters. While I’ve always taken a particular interest in the Civil War when it comes to studying American history, Hope is the real Civil War buff and had been beside herself with excitement for weeks at the idea of seeing her favorite time period gloriously displayed on screen. To our surprise, she was underwhelmed, while I absolutely loved it. Sure, it dragged a bit at the end, and I found the opening scene (in which Union soldiers recite the Gettysburg Address back to Lincoln during his visit to a battlefield) to be a little cheesy, but I just couldn’t (actually, still can’t) get over Daniel Day-Lewis’ tremendous performance as the president. Not to go all Roger Ebert here, but I have never been so convinced that an actor really was the person he was portraying. Obviously, there is no way of knowing whether he’s doing a spot-on impression of Lincoln’s voice, gait and mannerisms. But assuming tremendous research went into making it as accurate as possible, I don’t know how someone couldn’t be blown away by how real it seems. Prior to seeing the movie, I decided to start reading Team of Rivals, Doris Kearns Goodwin’s 2005 book upon which much of Lincoln‘s plot is drawn. I still have a ways to go with it, but I’m glad I read a little before seeing the movie (for, say, some background knowledge on characters like William Seward, Lincoln’s Secretary of State) and am finding it easier to digest with some mental image (albeit not the “real” thing) of characters and places described in the book. Master storyteller. If nothing else, Lincoln is worth it for the scene in which the president tells a story about Ethan Allen and a George Washington portrait in an outhouse (just trust me). It’s not just worth it because the story is laugh-out-loud funny; the way Daniel Day-Lewis delivers (and, I want to believe, Lincoln delivered) it – timing, emphasis, everything – is riveting. And as I read the book, I’m intrigued by all the mentions of Lincoln as a masterful storyteller. He grew up listening to his father regale friends, neighbors and travelers who boarded at their Kentucky home, carefully remembering every detail and re-telling the stories for his own friends the next day. Goodwin called it a “passion for rendering experience into powerful language.” From what I can tell so far, nearly everyone who made contact with Lincoln was smitten by his stories and the way his face lit up as he told them. I suppose I always thought of Lincoln as a no-nonsense, serious man, but I like knowing he was much more than a stoic face looking back at me from a Mathew Brady portrait. Savvy PR man. Lincoln believed you only are that which you are perceived to be. No matter what’s on the inside, people will like or dislike you (or vote for or against you) based on who they think you are, not who you think yourself to be. To me, this is a huge part of why companies invest in public relations: They want to control how they are perceived. To Lincoln, it was a driving factor in his political pursuits, primarily because he desperately wanted history to remember his name (mission accomplished), and knew that wouldn’t happen unless he made a name for himself in modern times. He seemed to believe, writes Goodwin, that “ideas of a person’s worth are tied to the way others, both contemporaries and future generations, perceive him.” I love that quote. Whether or not that’s how it should be, that’s how it is, and Lincoln played the political game with that in mind. I really don’t have much interest in modern-day politics, but I’m eager to learn more about how Lincoln’s rise to the top was aided by his deep understanding of perception’s importance. 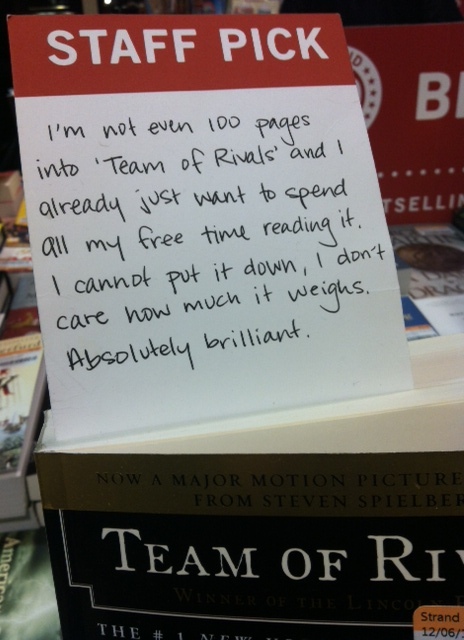 My copy of Team of Rivals is already littered with highlighter marks and Post-it notes as I organize my thoughts, but I might turn here in the coming days and weeks in order to archive and consider them more fully. And just for kicks: The Lincoln trailer, if you haven’t already seen it; background on how Lincoln came to life in the movie, from Diane Sawyer’s interview with Steven Spielberg and Daniel Day-Lewis; and if you need to be convinced that this movie is worthy of your time, Ebert’s review.